If you ever get a chance to visit China, this is the first place you want to make a stop. Not only is it the most coveted travel destination in the world, but also one of the most breathtaking and dripping with history. This man made fortification is one of the most spoken of structures since its discovery. It was created during the Ming Dynasty (between 220-206 BC) to protect the Chinese Empire against intrusions. It is made of stone, tamped earth and brick. The wall still stands strong because of regular rebuilding and maintenance. It is located on China’s northern border and makes a great addition to any travel album. 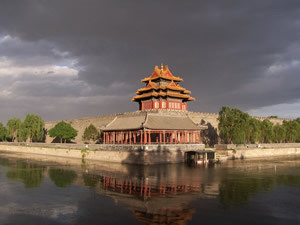 Another must see place is the Forbidden City, also in China. It is located in the center of Beijing, China’s largest city. In addition to being one of the most historical places in the world, it is one of the best places to travel to for those who wish to learn more about the Chinese culture. It gets the name “forbidden” because it was a palace to ancient Chinese Emperors and their royal families. No one was allowed entry or exit of the city without the Emperor’s permission. Anyone who has a distinct interest in Asia has heard of the Taj Mahal. The reason it makes a great destination for those traveling in Asia is because apart from the fact that this place is simply breathtaking, the Taj Mahal itself is considered the most globally admired masterpiece of the world’s heritage. This is because of the unique blend of architectural styles that were used in its construction. It makes the prefect travel destinations for architects and historians but would also make a great family stop over for a round of photo sessions, mainly because of the magnificent background. If the exterior does nothing for you, you will love the one-of-a-kind exquisite interior gemstone decorations. Tokyo Disney makes the perfect travel destinations for families who travel to Asia. Not only is it a fun place to be because of the multitude of activities which are tailored for kids and grownups, you also get to meet some of your favorite Disney characters, dine, shop and have immense fun at the Tokyo Disney Resort. There is a plethora of theme parks, a unique dining style, as well as an endless number of shops and accommodations. Make this summer the best travel experience of your life by visiting any of these amazing places in Asia. You’ll love it!